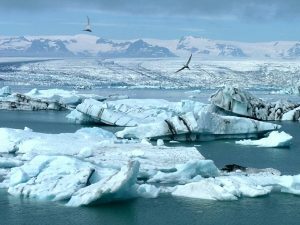 What are the contributions of glaciers, ice caps and polar ice sheets to the rise in sea level and what is the nature of the influence of climate change on their mass balance and dynamics? How do the distributions of the extent, thickness and other physical characteristics of sea ice look like and how do they react to climate variability and change? How do changes in the snow and ice masses influence the surface energy balance and the circulation of the atmosphere and the ocean? Which spatial and temporal changes in the snow and ice extent and mass are to be expected on the continents in the coming decades, and how will these influence the water budget, ecology and biodiversity? How does climatic change affect the stability of permafrost and the annual freeze and thaw dynamics? What are the ecosystem responses to degrading permafrost and what are the impacts on the Arctic carbon cycle? How do the components of the Cryosphere interact and are there relevant feedback mechanisms between sea ice, snow cover and permafrost? Are changes in the Cryosphere triggering abrupt or critical changes in the world’s climate system?